Cotton is potentially one of the most lucrative crops for the developing countries, particularly sub-Sahara Africa, allowing both governments and locally based commercial organisations to develop textile industries for a welcome boost to foreign earnings. Indeed, such is the value of cotton to all concerned that farmers are offered levels of support and subsidy not generally available for other crops. With such rewards on offer, many farming communities, encouraged by their governments, have moved into cotton with relish only to have their hopes and their farm economies dashed time and time again due to failure to manage insect pests. 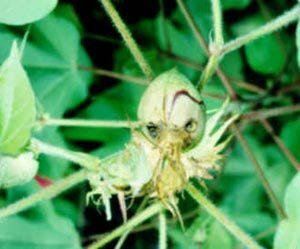 Cotton is bombarded with insects in sequence from the appearance of the cotyledons through the soil until the bolls are safely gathered in. No other crop, with perhaps the exception of rice, is attacked by so many different insect types and species and with such ferocity and no other crop, including rice, has sealed the commercial fate of so many insecticides. Indeed, cotton is a graveyard for insecticides as new product after new product is tried and tested only to fall foul of natural enemy destruction and/or insecticide resistance. The fact that almost all conventional insecticides belong to only four distinct chemical groups – organochlorines, organophosphates, carbamates and pyrethroids – and that the natural enemies of insect pests are largely, like their prey and hosts, insects themselves only serves to exacerbate the problem. In spite of this “ insect plague” which appears to follow cotton wherever it is grown, the root of the control problem and its solution lies in ways in which insecticides are delivered and applied and a more detailed understanding of pest and crop biology. In the past, there has been a tendency only to point the nozzle and spray, with higher volumes and dosages perceived to offer the best option; there was nothing more reassuring for a farmer than to put an extra spoonful of insecticide into the spray tank for good measure and to see the spray dripping from the leaves. The net result was the application of too much active too often and at the wrong time with the inevitable consequences of natural enemy destruction, pest resurgence and insecticide resistance. In many parts of the arid tropics notably sub-Sahara Africa, most cotton farmers did not spray at all before the advent of CDA if for no other reason than that the low water resources were unable to fulfil the high volume demands of LOK (lever operated knapsack) and pneumatic (pump-up) shoulder-slung sprayers. The single most important invention to ease this cotton-spraying nightmare was the hand-held spinning disc sprayer which produced droplets by rotary atomisation from the teeth of a rapidly rotating disc. Liquid fed onto the disc formed ligaments of liquid at the points of the teeth from which small droplets of uniform diameter were formed and spun-off by centrifugal forces. The first hand-held spinning disc CDA sprayers were designed to be used with custom-designed pre-formulated and pre-packed Ultra Low Volume (ULV) formulations based on non-aqueous and low evaporation potential carrier liquids, used at total application volumes of 1-3 litres/hectare. This, technique ensured non-evaporation of spray's transport, improved longevity of deposits and, with pre-packed chemicals, improved operator safety (by minimising chemical handling) and improved accuracy of dosage (by minimising errors in calibration). ULV cotton spraying for smallholder farmers swept East and West Africa in the 1970s, resulting in substantially increased yields, with the support and co-operation of the agrochemical industry. However, while some agrochemical companies, notably Hoechst and Ciba Geigy, took on board this machinery development and provided farmers with the required formulations, availability was limited, meaning that not all farmers were able to apply the full spectrum of products. Some countries attempted to overcome this constraint by mixing products in locally available vegetable oils, for example cottonseed oil in Tanzania, or by adding anti-evaporants, such as molasses in Zimbabwe. Gambian researchers started to examine the use of water alone as a carrier but the design of older sprayers, such as the Micron Ulva 8 and Micro Ulva, were inappropriate to deal with the higher flow rates of water required and the electric motors used in these models were not sufficiently robust. 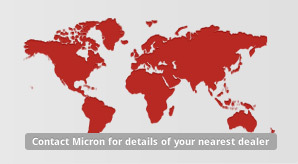 It was the development by Micron Sprayers, originator of CDA, of the dual purpose ULV/VLV (Ultra Low Volume/Very Low Volume) CDA sprayer, aptly called the ULVA+, that brought the benefits of Controlled Droplet Application and the use of proprietary formulations of insecticide together within a single application system. Armed with a brand new, specially designed disc, a more robust motor and a backpack reservoir system for higher volumes, the ULVA+ was designed to be able to produce droplets of 120 µm diameter from water based formulations (to compensate for evaporation) and still cover one hectare of cotton with only 10 litres of total spray liquid – very low volume (VLV) spraying. The single biggest and immediate bonus for farmers was that they could now mix their own sprays using water as a carrier and thus tap into mainstream proprietary formulations (Emulsifiable Concentrates, Flowables etc) of all insecticides recommended and used for cotton insect pest control. Other benefits included the facility to “mix and match” actives, thus broadening the activity spectrum of a single spray and sequencing actives so that the threat of insecticide resistance is minimised. In the final analysis, the only way to determine whether or not a particular spray method will perform the task in hand and better or worse than an alternative, for a specific insect pest, is to study the biology of the pest on the crop so that it can be pin-pointed for spot-on control, both in time and space with the highest degree of accuracy. 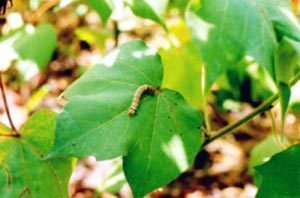 Helicoverpa armigera (the Old World bollworm), the most difficult to control insect pest of cotton, illustrates the case in point. The pests are polyphagous with robust larval instars and the adult moths are strong fliers, so that there is only one realistic window of control opportunity – when the larvae are both small and exposed. The larvae of H. armigera are most susceptible, spatially and toxicologically, just after hatching from the egg. In this first to second instar larval stage, they have a very small body mass and can therefore be killed using small droplets carrying correspondingly small doses of insecticide. At this time they are known to feed at the branch tips on young emerging leaves and squares (flower buds), fully exposed to droplets drifting in from rotary atomiser sprayers, before “diving” deeper into the canopy to satisfy their later instar dietary requirements in the form of large flower buds and bolls. The whys and wherefores of spray applications in a crop like cotton with all economically to play for are fiercely fought but, in the end, choice of spray application may be governed by much simpler factors than insect ecology, for example the availability of water.